If you read the headlines (or the obituaries), you know that heart disease, cancer, diabetes and other ailments send too many people to an early grave. But some individuals both escape those scourges and remain in good condition well past the average age of death. Just look at Robert Marchand, the French cyclist who last year beat his own world record in the 100-and-over class by riding almost 27 kilometers in one hour. He was 102 years old. Marchand and others like him are part of the surprisingly fit cohort known as “the oldest old,” described in an article by geriatrician Thomas T. Perls. The latest studies of people in their 90s and beyond reveal that they are often as vigorous as much younger people and are able to maintain their good health—mental and physical—for many decades. Investigators are studying this group in the hope of finding helpful insights for the general population. Can we live forever? Not likely. But as British aging expert Thomas Kirkwood writes in “Why Can't We Live Forever?”, science provides an abundance of clues about how we can live longer and, more important, stave off infirmities for as long as possible. Exercise is proving to be a key factor, as several authors in this collection emphasize. Changes as simple as standing instead of sitting can have enormous benefits for weight loss and metabolism. Researchers are also exploring strategies such as intermittent fasting and are punching holes in once accepted theories about the antiaging effects of antioxidants and vitamins. A couple of articles focus on new ways to slow age-related forgetfulness. In some cases, steering clear of medicines that can affect memory does the trick. There is plenty of good news on the drug front, though. Scientists are working on interventions for detecting and tackling Alzheimer's disease before symptoms appear. They are experimenting with stem cells as a way to repair brain damage from Parkinson's disease and to treat diabetes and cancer. 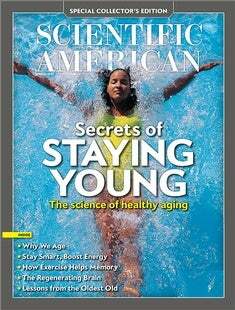 Moreover, they are investigating drugs that would slow aging-related processes at the cellular level, as science writer David Stipp investigates in “A New Path to Longevity”. Will these techniques for staying healthy to a ripe old age send us into denial about our own mortality? Let's hope not, because the contemplation of death can make our lives more meaningful and less stressful, as “Mortal Thoughts,” by psychologist Michael W. Wiederman explains. Every day is a fresh chance to live a healthier, happier life. Will People Ever Live Forever?